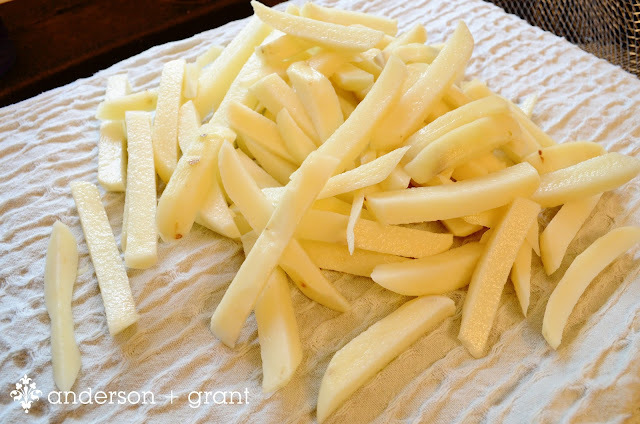 Of all the foods that can be made fresh at home, french fries are one of my favorites. Contrary to what some people may tell you, with the right tools, the process of making this delicious treat isn't hard. McDonald's has great fries. Ore-Ida makes it possible to empty a bag onto a pan and get crispy fries in the oven. 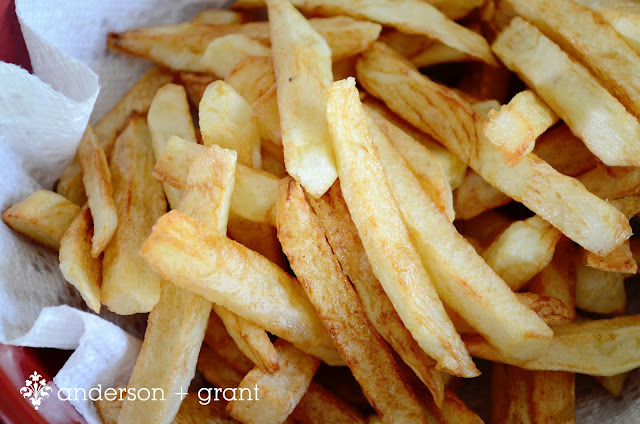 But the best fries in my opinion are made at home, cut from fresh potatoes and fried in hot oil. 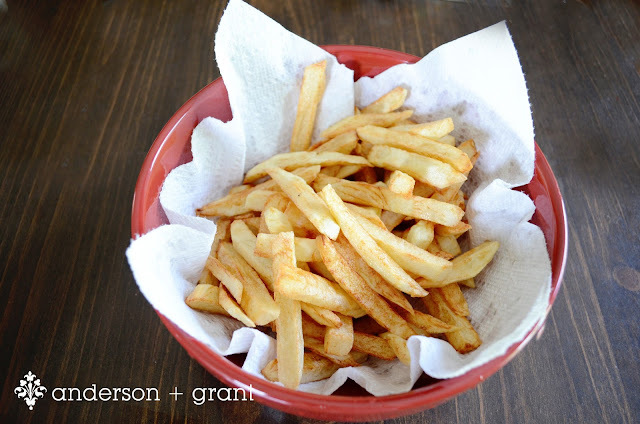 WHAT EQUIPMENT DO YOU NEED TO MAKE FRENCH FRIES AT HOME? In order to make the best homemade French fries at home, you need a heavy duty metal french fry cutter. 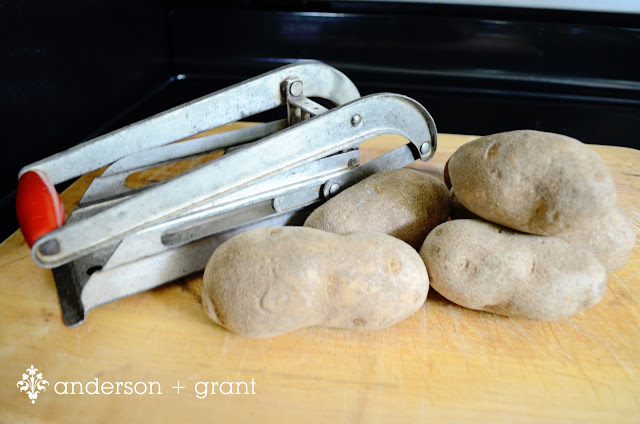 Yes, you can cut the potato into strips yourself, but if there is a tool for the job, why not use it? It saves time and makes your slices uniform in size which helps ensure all of your fries are cooked the same. Although I used a vintage one, brand new French fry cutters can be found online or in stores. I would recommend one that is made completely of metal (it will last a lot longer than one made of plastic) and restaurant quality (which is sturdier than basic models). The second tool I think you need for great homemade fries is an electric deep fryer with a basket. Again, this is not necessary in order to make fries, but I think the tool makes the job easier. Deep fryers make the job less messy and are equipped with internal thermometers to monitor and regulate the heat of your oil. I use one from T-Fal and it works great. What I really love is that it has a built in filter that allows you to drain and clean the used oil so that it can be used more than once. It makes keeping the entire machine clean simple. If you aren't interesting in purchasing a fryer, though, the oil can be heated on a pan on your stove top and the temperature of the oil can be monitored with a deep-fry thermometer. 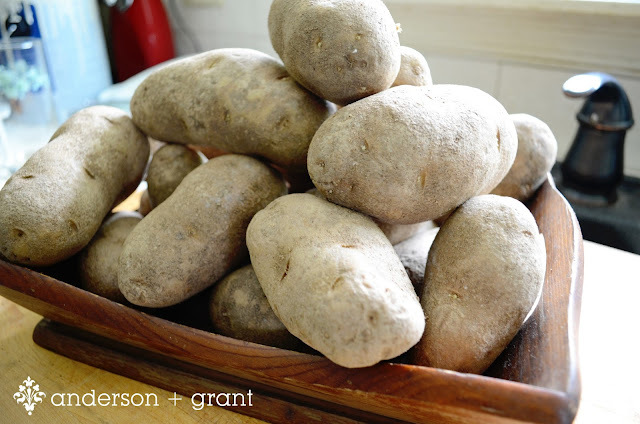 Potatoes like russets or Idaho are best for making fries. I like to find potatoes that are about the same size as my french fry cutter because I will get the longest fry possible. 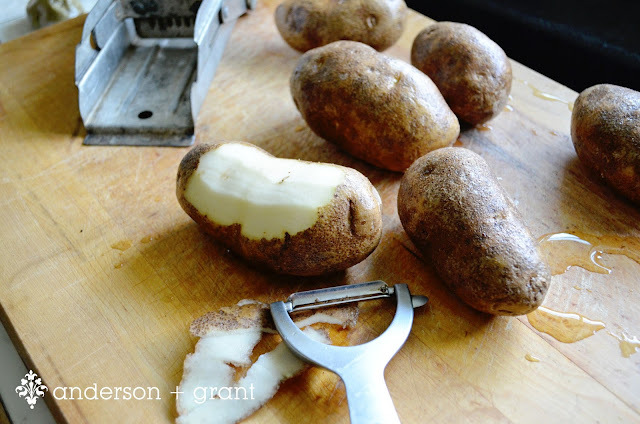 Wash your potatoes and then peel the skin away with a vegetable peeler. I like to remove all the skin, but you can leave some on for more rustic French fries. 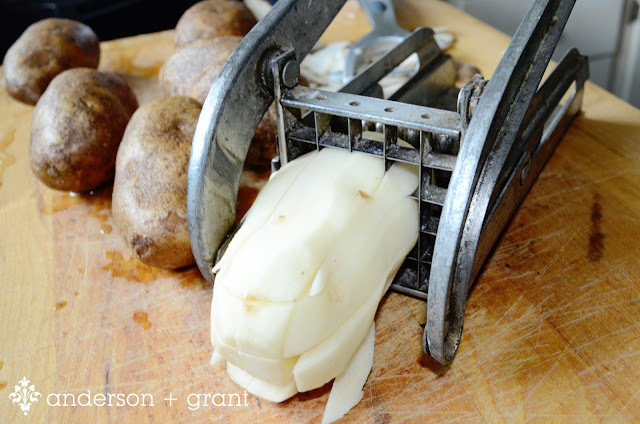 Set the potato inside the french fry cutter and press down on the handle slicing it into strips. As you cut the potatoes, add the slices to a bowl of ice cold water. The water is one of the keys to getting fries that are crispy and cooked throughout. 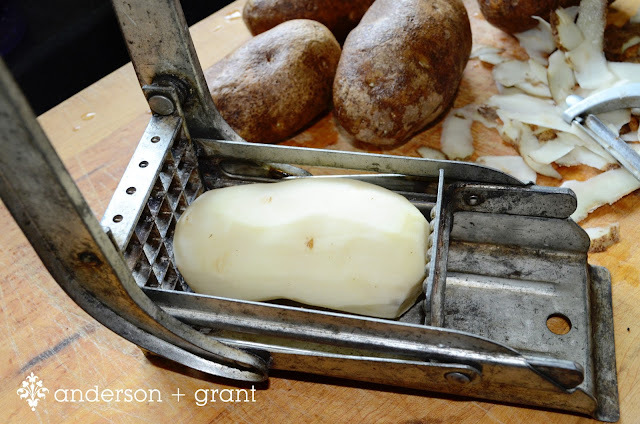 It removes the starch in the potatoes, keeps the fries from sticking together, and eliminates the sugars that keep the potato from getting crispy. Also, the bowl of cut fries in the water can be placed into the refrigerator for at least two hours to overnight before making the fries. This will help them to turn out crispier. 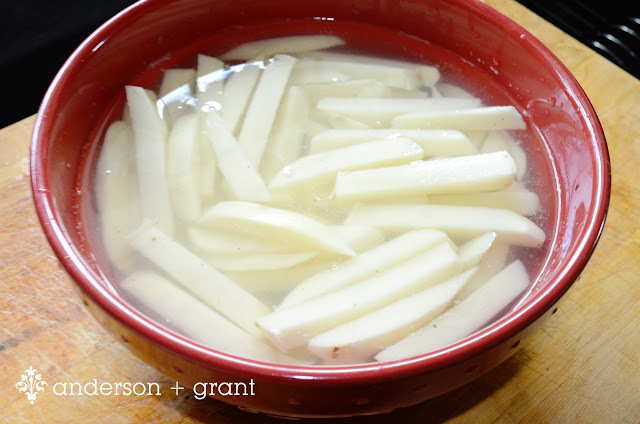 After the potatoes have soaked pour the water out and rinse the fries in clean water. Empty the potatoes onto a towel and pat them dry. Drying off the potato sticks is important for getting a crispy fry. I like to keep a lint-free towel specifically used for this purpose. The oil in your fryer should be preheated to the temperature recommended in your owner's manual to cook French fries. Most fryers will have a light that comes on when the oil has reached the right temperature. When the oil is heated, put the potatoes into the fryer basket and place the basket carefully into the hot oil. Cook the fries for about 13 to 15 minutes or until they are a golden brown color. 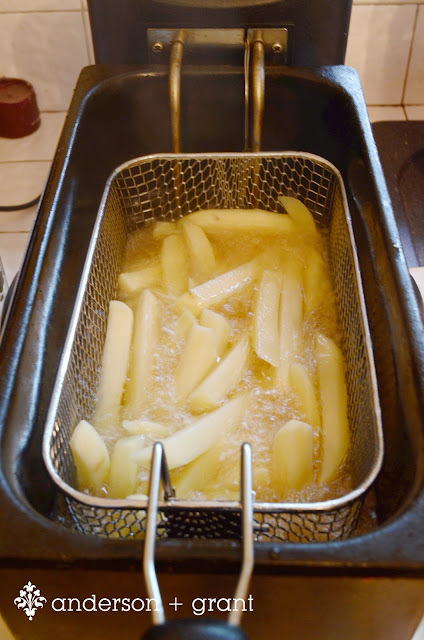 Remove the fries from the hot oil and empty them into a bowl lined with paper towels to absorb the grease. 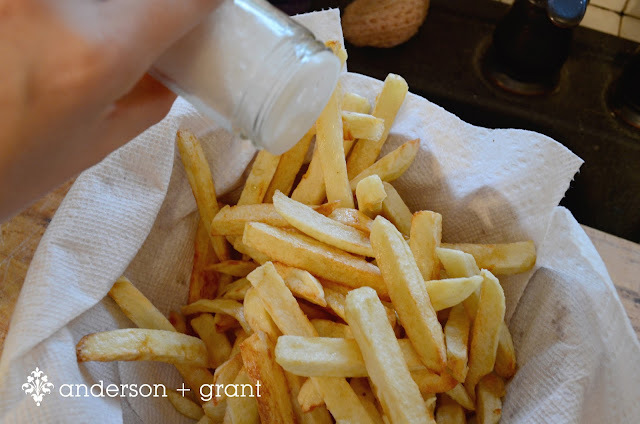 Season the fries with kosher salt or other seasonings if you'd like while they are still warm.